Observation - Gred Squirrel - UK and Ireland. Description: Sorry about poor quality, will make confirmation hard, it was off before I could get closer. peaked my interest with its very pointy red ears! Seen in a pub garden adjacent to a woodland park in Walsall. 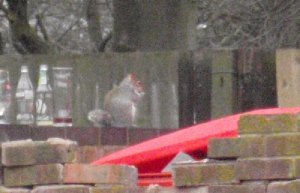 Sorry about poor quality, will make confirmation hard, it was off before I could get closer. peaked my interest with its very pointy red ears! Seen in a pub garden adjacent to a woodland park in Walsall.